Back in September of 2011, we brought you a preview of the things to come over at the new Las Vegas location of Wild West Guns. Since then, things have been moving along and the store had their soft opening about 2 months ago. 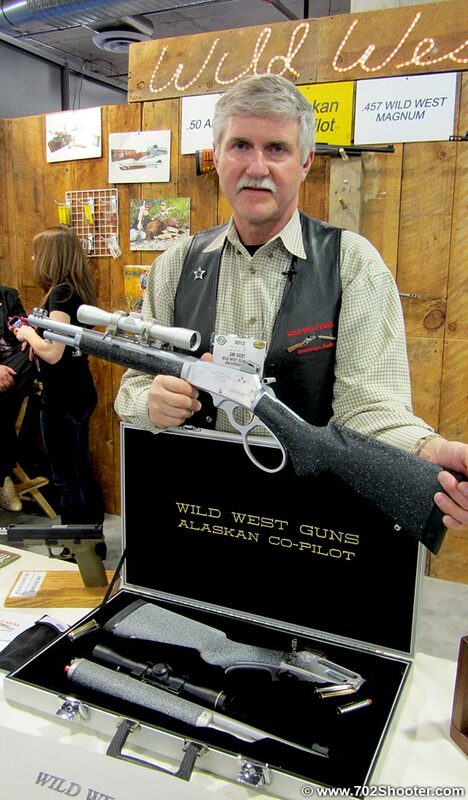 Brian, their lead gunsmith from Anchorage, came down during the Shot Show and showed the Vegas gunsmiths how to build their famous Co-Pilot rifle. Th Co-Pilot starts off as a stock Marlin 1895 lever action rifle. It’s then cut in half and made into a 2 piece breakdown rifle which is designed for easy stowage behind the pilot seat of small airplanes. They offer it in 45-70, .50 Alaskan, and the 457 WWG which was just submitted to SAMI for approval. The rifle comes with a ton of upgrades and customization options that can push the price tag close to the 10k mark. Although they have some on display in their stores, these guns are typically not the kind of thing you buy off the shelf. The are built one off to suit the individual needs and tastes of those who purchase them. This is not your Grandapa’s lever action. This would be good for those wild hawgs here in Texas. I would really like to come to your Shot Show. Sounds great! How much is a car? How much is a bike? How much is a necklace? Kinda depends on what model and accessories. I’d suggest you contact the manufacturer and ask for their pricing.